Race is like gender. As society becomes more equal in those areas, leftist instigators resort to making up conflicts in order to create victim status where there is no longer much left. The Ferguson riots are a classic example. Every day across the country, police officers shoot criminals and nothing happens; there is no outcry or rioting, because the police officer is not white and the perpetrator is not black. But if the police officer is white and the perpetrator is black, suddenly the race baiters care, and instead of waiting for the facts to come out or an adjudication by a jury of peers in a court of law, they declare that the shooting was the result of racism. Political researcher Trevor Loudon has written an exposeon the left-wing activists who organized the violent Ferguson protests, detailing their long histories of inciting riots. Lisa Fithian, a white woman known as “Professor Occupy” for her leadership organizing Occupy Wall Street, trained people specifically for the Ferguson riots. The ramifications of this trial by race baiters are deadly and only serve to needlessly worsen race relations. The Ferguson confrontation was provoked after Michael Brown was filmedin a convenience store surveillance video threatening and assaulting a shopkeeper, then committing strong-arm robbery of a package of cigarellos. Officer Darren Wilson, who was assigned to follow up on the crime, said he shot Brown in self defense. Brown refused to succumb to arrest and instead charged him, reaching for his gun. The official autopsy revealedthat Brown had been shot six times from the front and had marijuana in his system. Two other autopsies, one ordered by Brown’s family and one by the FBI, also found that none of the six shots hit Brown in the back. Dr. Judy Melinek, a forensic pathologist in San Francisco, saidone of the wounds was consistent with Brown reaching for Wilson’s gun, and none reflected that he was running away or had his hands in the air. The grand jury, composed of three blacks and nine whites, listened to testimony from more than 60 witnesses before determining there was not enough evidence to go forward with an indictment. This is even more significant considering the level of proof required for an indictment in order to start prosecution is only probable cause, not beyond a reasonable doubt as is required for a guilty verdict at the conclusion of a trial. Additionally, the prosecutor gave jurors the discretion to find probable cause for a multitude of crimes, ranging from negligent manslaughter to intentional murder. Nevertheless, 9 of the 12 jurors would not agree to indict Wilson on anything. Immediately after the jury announced the decision not to indict, the stepfather of Michael Brown, Louis Head,turned to the crowd of demonstrators and cried, “"Burn this motherf***er down" and "Burn this b*** down," recorded in a New York Timesvideo. Soon afterwards, many businesses were looted and burnedto the ground, including small businesses owned by blacks. A photowent viral of Natalie DuBose crying, a black woman who owned a bakery that was vandalized. 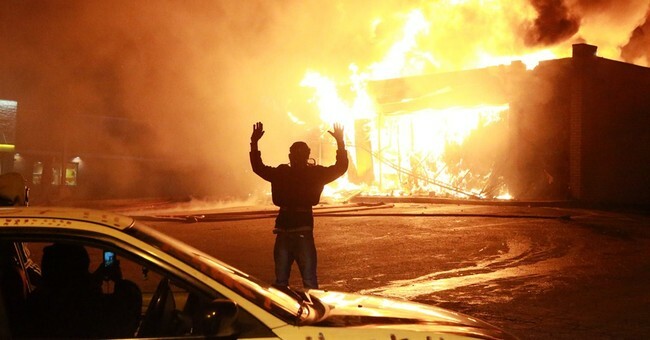 In contrast to Brown’s stepfather, who allegedlyhas a criminal record, his real father released a videoto the Ferguson community prior to the verdict saying, “No matter what the grand jury decides, I do not want my son’s death to be in vain … hurting others or destroying property is not the answer.” After the rioting started, he toldCNN, "The ones looting and rioting, they are doing it on their own agenda." Bizarrely, Ferguson Chief of Police Thomas Jackson - who is responsible for keeping the peace, upholding the law and protecting citizens - at one point attempted to joinprotesters who were calling for his resignation. Not surprisingly, within 30 seconds the attempt ended in violence, and riot police jumped in to protect him. Democrat Governor Jay Nixon also botched handling the protests. The National Guard should have been in place ready to stop rioters from pouring gas on businesses and setting them on fire. Sadly, like Jackson, Nixon appears to have been more interested in appeasing the race baiters than public safety. Seeing the looting brazenly taking place, members of the patriotic organization Oath Keepers, made up of former law enforcement and military, flew in from all over the country and did what the government would not, standing armed on the roofs of businesses to protect them. Incredibly, police threatenedthe Oath Keepers and made them leave, despite the gratitude of several store owners who had been looted. The lack of journalistic ethics has been appalling. The New York Timessent a reporterto cover the riots who had a shoplifting conviction herself. That reporter published the name of the street she thought Officer Wilson lived on, knowingly jeopardizing his life. The newspaper reprinted a retraction and it was later observed that Wilson no longer owned the house with his ex-wife, but it didn’t appear that the reporter knew nor cared when she included it. It is a crime in most states to publish the home address of a law enforcement officer. Officer Wilson’s life appears virtually destroyed, and will likely never be the same unless he leaves Ferguson. Despite the fact he was fully exonerated by a jury, and had an unblemished career with the police department, he was forced to resign with no severance pay. It is also sad how Brown has been used as a pawn of the race baiters after his unfortunate death. Brown made a foolish mistake by stopping at a convenience store after he had gotten high. Many people have done something this stupid and tragically fatal. But they would not want their death to result in more deaths and destruction, especially within their own community, crying racism yet hurting their own race. The white leftist agitators instigating the riots would rather hurt more blacks in the community than heed the pleas of Brown’s black father. If the race baiters and violent left-wing agitators were really concerned about racism, they would focus their efforts on areas plagued with real racism. The U.S. is one of the least racistcountries in the world. The race baiters will not, because stopping racism is not their agenda. Dismantling the free market and capitalism, and ultimately the United States by any means including anarchy, is their real agenda.